Prostate cancer is the second most common cancer in men. On any given Sunday, one in seven men watching an NFL game will be diagnosed with this disease, but the odds increase to one in five if they are African-American and one in three if they have a family history. These are stats that no one wants to see up on a scoreboard. 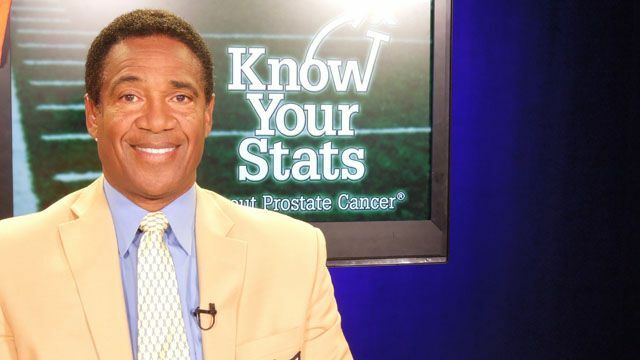 I spoke to pro football Hall of Famer and prostate cancer survivor Michael Haynes about his partnership with an early detection campaign called Know Your Stats and his career as one of the best defensive backs in NFL history. Listen to the full interview here. I don’t think they even take the defense into consideration when they make rule changes – they take you guys, the fans! You guys are the ones they are considering. It’s like, how can we make our game more exciting? How many fans love a 7-3 football game? I know how important that is. I feel the anxiety and the energy in those 7-3 battles. But today, if a team can’t score 21 or 28 points, something is wrong with that offense. The coach may be fired, his job may be in jeopardy. Anyway, it’s a different game, but I still love the game. I guess. The rule changes have changed the game so much. A lot of people are not aware of the importance of the rules and how they affect the game. There was a time when the hashes were wider. And when the hash marks were wider, it was very rare that a running back would rush for 1,000 yards. Floyd Little of the Denver Broncos, I recently had a conversation with him about this, and he shared the story that he was the 13th running back in history to rush for 1,000 yards in a season – it was a huge, huge milestone. Today, it’s not a huge milestone. Now, it’s almost commonplace for a guy to rush for 1,000 yards as a running back. So, that created a huge difference in the running game. Darryl Stingley was paralyzed on a hit by Jack Tatum in a game against the Raiders. It kind of changed my life. I realized that could have been me that made the hit on Darryl. I almost retired because I realized that hurting opposing players is not what I should be trying to do. That’s what I wanted to do – I wanted to hurt them. I didn’t know how to play football without thinking that way. At that time, a lot of guys called me because they knew I was thinking about retiring because of the hit, and that changed my life. “No, Mike – hit us hard, just help us up.” It changed my mindset. But they had no idea how in the locker room I’d just sit there and sit there and get myself psyched up to go out there to be this mean son of a gun that was going to hit hard and try to hurt people. And what do I do now? What am I psyching myself up for? The game has changed, and now it’s a collision sport, not a violent sport. We intimidated our opponents. First of all, we had a bunch of tall defensive backs. Every single defensive back was at least 6’1”. All of us weighed at least 200 pounds. We were the biggest secondary, the fastest secondary and we had a defensive coordinator named Charlie Sumner who loved to play offense on defense. He went after people. On 3rd and 18 situations, he’d call an all-out blitz. He didn’t care. It was about the intimidation factor. They don’t allow you to play football like that anymore; a player cannot intimidate another player. We used to intimidate the referees! “I dare you to call it! I dare you to call a penalty on me!” Lyle Alzado, I’ll never forget this. A referee said, “Alzado, I saw that.” He had hit a guy, punched a guy. “I see that again I’m throwing you out of here.” And he said, “You don’t have the balls to throw me outta here!” And he didn’t get thrown out! You can’t do that anymore. Now the league has changed completely.